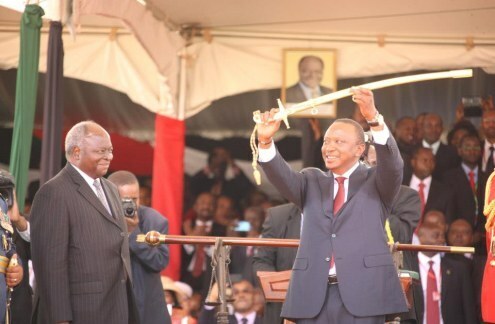 NAIROBI— Uhuru Muigai Kenyatta was sworn in as Kenya’s fourth president amid wild cheers from tens of thousands of supporters at the Moi Sports Complex in Kasarani. The oaths were administered by the Chief Registrar of the Judiciary Gladys Boss Shollei in the presence of Chief Justice Willy Mutunga. The new president took two oaths, one pledging allegiance to the Constitution and the second, a solemn affirmation of due execution of office of president. “I do swear that I will be faithful and bear true allegiance to the Republic of Kenya,” Kenyatta said, clutching a bible as he took the oath of office Kenyatta. He also pledged to uphold the sovereignty integrity and dignity of the people of Kenya. After the President took the oath Deputy President William Ruto also took the oath of office in according to the Constitution. Just like the president, Ruto also took two oaths-one of allegiance and another for the execution of functions of office. “I will always truly and diligently serve the people and the Republic of Kenya in the office of the Deputy President,” he also added that he will do justice to all without fear, favor, affection and ill will. 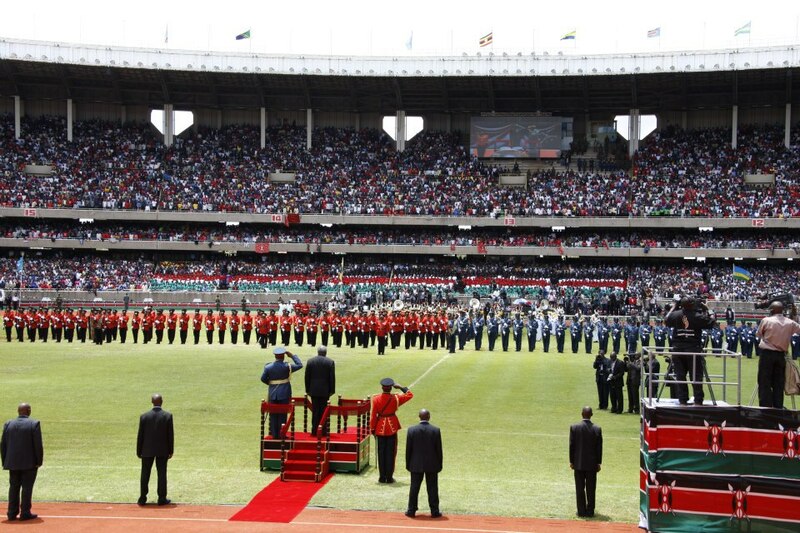 Officials had to appeal for quiet as the 60,000-strong crowd chanted Kenyatta’s name and roared in support amid dancing. “We now have the office of the president and of the deputy president,” Shollei said after she completed the swearing in. The inauguration ceremony was attended by several heads of state and representatives of foreign governments. They included Nigerian President Goodluck Jonathan, South Africa’s Jacob Zuma, Zimbabwe’s Robert Mugabe and Ismail Guelleh of Djibouti. Uganda’s Yoweri Museveni and his Tanzanian counterpart Jakaya Kikwete also graced the occasion. Others were South Sudan president Salva Kiir and Paul Kagame of Rwanda among others. Security was heavy as Kenyatta loyalists, dressed in the red colours of the winning Jubilee Coalition party, waved as military bands played tunes to welcome the new leader and say farewell to outgoing President Mwai Kibaki, 81, retiring after more than a decade in power. Before handing over power, retiring President Mwai Kibaki circled the stadium waving to crowds from an open topped vehicle and accompanied by a guard of honor.